Scholarships to graduating adult and high school students for further post-secondary education. 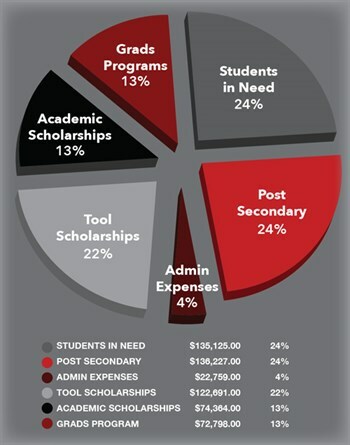 Financial support in the form of tools to worthy students demonstrating a need. An endowment fund to support the purposes of the Foundation. Requests of the donor as approved by the Foundation. Student/teacher grant programs for projects outside the normal school curriculum that will enrich the opportunities for the students of the Apollo Career Center. The AEF’s goal is to raise $100,000 each year to address the needs of Apollo Career Center students, and to support the educational goals of the district. Leigh McCullough-Steinke is a 2006 graduate of the Health Careers program. Leigh was the recipient of an academic AEF scholarship and obtained her STNA in high school while working as a Tech for Lima Memorial Health System. Upon earning her LPN degree, Leigh worked as an LPN, and then moved into her position as a clinical buyer. David Blackston is a 1999 AEF tool scholarship recipient. After graduating from the Electricity program, David obtained his electrical engineering degree and is currently an Imaging Specialist/ BioMed at Lima Memorial Health System. Ashley Miller is the president of Quality Welding and Fabrication, LLC, Elida. Ashley was the 2003 Welding recipient of the AEF tool scholarship.